In back-to-back concerts, Bates College presents the classical artists G-Sharp Duo at 8 p.m. Friday, May 18, and a jazz performance by steel pan artist Shawn Thwaites at 8 p.m. Saturday, May 19. Both concerts take place at the Olin Arts Center Concert Hall, 75 Russell St., and are open to the public at no cost. For more information, please call 207-786-6135. 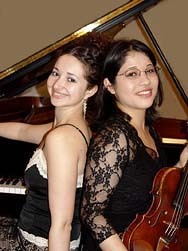 The G-Sharp Duo consists of violinist Emilie-Anne Gendron and pianist Yelena Grinberg. They will present the Maine premiere of “Moon Petals” by Bates College Orchestra conductor Hiroya Miura, along with works by Schubert, Beethoven and Schumann. The evening after the duo’s Bates appearance, the college’s “Jazz at the Olin Arts Center” series presents Thwaites, director of the Bates Steel Pan Orchestra, leading a six-piece band. The ensemble will perform jazz standards and selections from Thwaites’ debut solo CD, Soul Meets Steel, which features Thwaites playing and improvising to current R&B, rap and rock hits. The concert will include Thwaites’ composition “Bates Groove,” which he wrote for the Steel Pan Orchestra. The G-Sharp Duo’s Gendron and Grinberg founded their ensemble in 2003 while they were students in the Barnard-Columbia-Juilliard Exchange program. Over the past few years, they have been lauded by New York’s classical music community for their expressive and thoughtful performances. Both performers are prolific. Gendron has performed internationally and won the 2002 Stulberg International String Competition. Grinberg was the winner of the third Bach Society Concerto Competition at Columbia University. The G-Sharp Duo’s awards include first prize in the duo category of the International Chamber Music Ensemble Competition, and they have performed at such venues as Columbia’s Miller Theatre, Steinway Hall and Carnegie’s Weill Recital Hall. While focusing on classical music, the duo is venturing increasingly into contemporary repertoire. The pair presented the world premiere of Miura’s “Moon Petals,” which was written especially for the duo, at Columbia. Thwaites was taught steel pan by his father, Robert, a stalwart in the field. 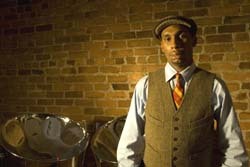 He has performed in numerous steelbands in the United States and abroad. He and his brother Sherwin were the first two scholarship students accepted by Berklee College of Music with steel drum as their principal instrument. Thwaites performs and arranges music for Bates’ Steel Pan orchestra, as well as for his own Thwaites Trio and for his nonprofit organization, Pan United Youth Movement. Based in Newark, N.J., the organization offers comprehensive Caribbean steel-drum instruction to young people, with the broader aim of using performing arts as a means to building confidence and leadership skills.